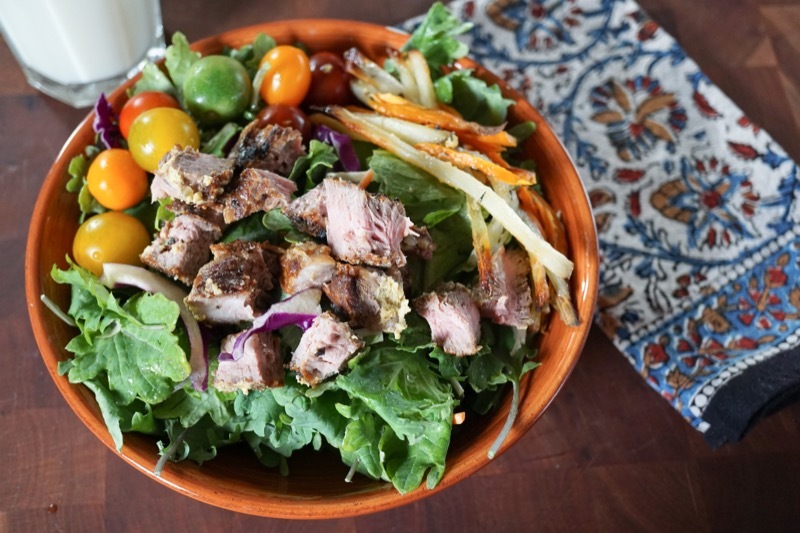 Add a little “healthy” to your holiday menus with this easy chipotle steak salad! Peter is a genius. Obviously. Last spring, when we were putting away our artificial Christmas tree (yes, our Christmas tree was up until March–baby time-vortex, remember? ), he removed the handful of breakable ornaments and shoved the tree into a tree bag. This lumpy green bag sat in an unused part of our garage like some strangely tall Jabba the Hutt until this past November, when Peter pulled the tree out of the bag, fluffed a few branches, and plugged it in. It was that easy. 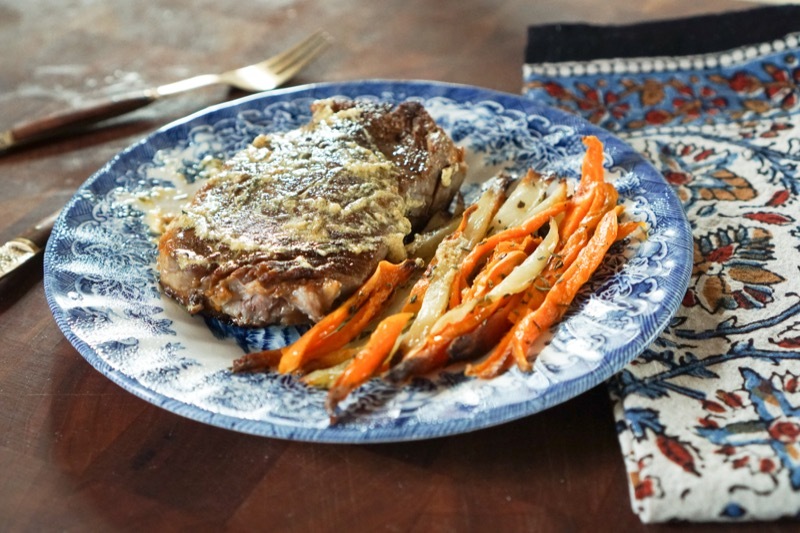 Yet I almost bailed when I discovered that the only recipe on a ‘2016’ page was “Steak with mustard butter and French fries.” Not because the final result wouldn’t taste good (I mean, steak + potatoes + butter = c’mon people, that’s amazing), but because I couldn’t decide how to ReDux the recipe. 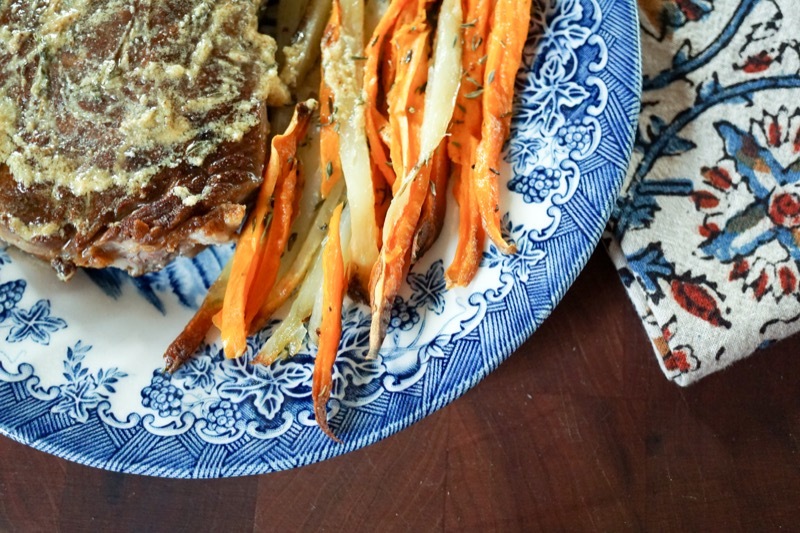 Use olive oil instead of butter? Squash fries? Tofu??? 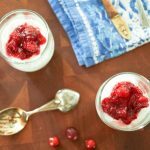 That’s when Peter brought me back from the brink of insanity by reminding me of how committed I am to enjoying all kinds of foods even if they don’t fit the traditional mold of a healthy living blogger recipe. I don’t need to change the ingredients; rather, I can enjoy the beautiful rich flavors of this dish over extra veggies by using a technique I praised years ago. 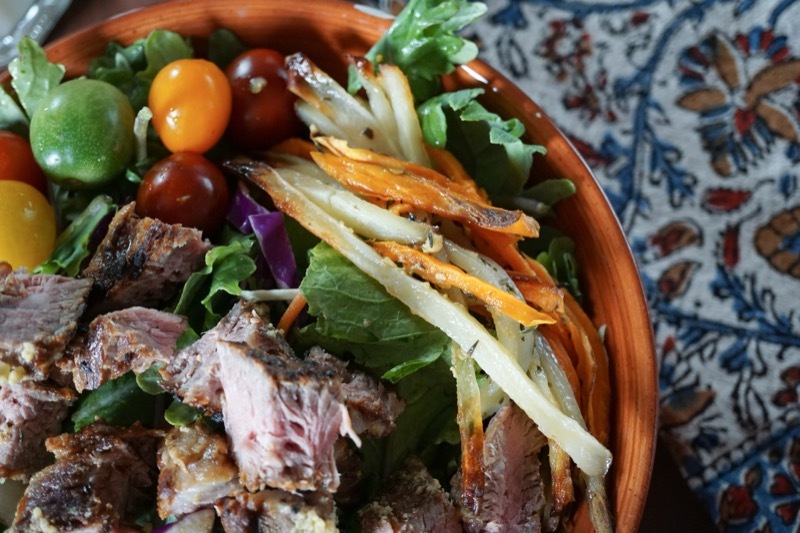 Steak salad it is! The original recipe is fast and easy and uses chipotle pepper, which check off pretty much everything on my “must make” list. I changed up the recipe by using less salt, leaving off some of the seasoning (because we didn’t have it–check out original recipe for details), and reducing the portion size. The latter was necessary because while Baby J has a voracious appetite and can eat Maddie‘s weight in mozzarella cheese, eight ounces of steak might be a tad too much for him. Also, this is a good moment to review portion sizes for protein foods. An easy rule of thumb for meats is to choose 3-4 ounces in a meal, which is about the size of your palm (Baby J, of course, gets less than that). Many restaurants will serve two or three times that much, which is really more than anyone but Robert Wadlow should eat. So, dear reader, be that restaurant patron who lays her hand next to her steak to compare sizes. You’ll be the coolest customer in the room, I promise. 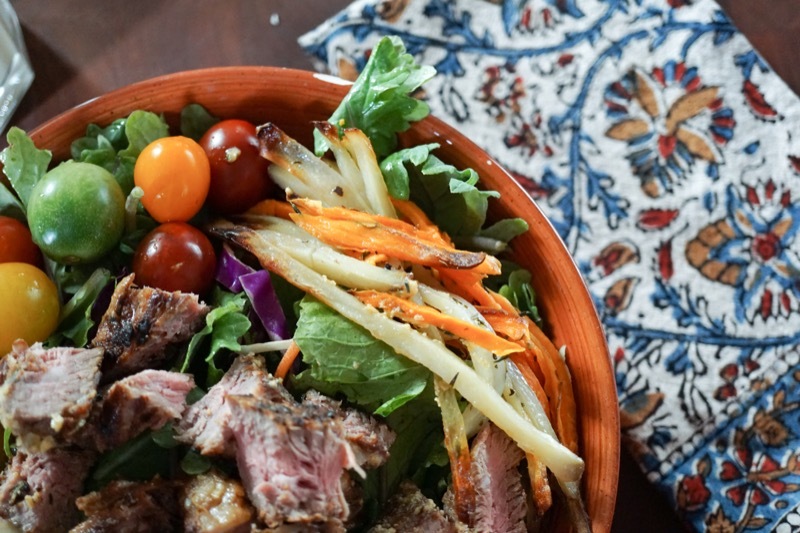 This meal feels light from the mix of greens yet satisfying from the seared marinated steak. A helping of French fries (yes, fries!) on the vegetables turns this nontraditional salad into something special. 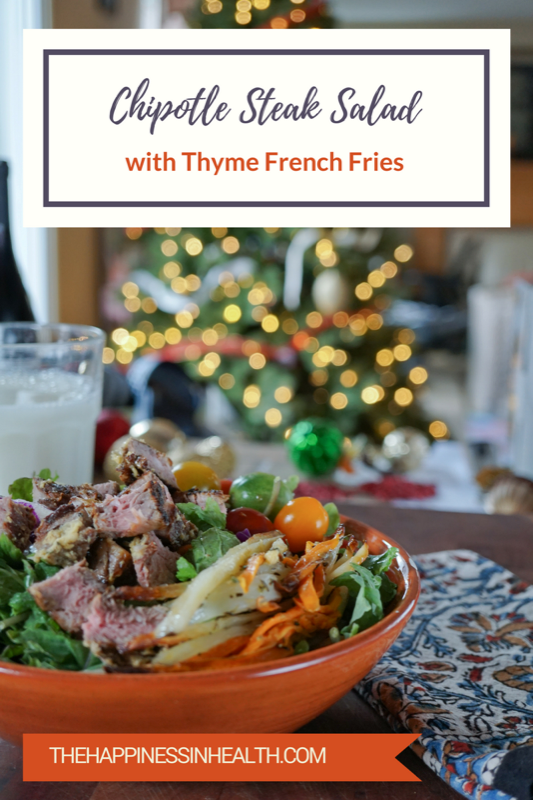 The warm steak and fries wilt the salad a little, making this dish feel even fancier. Toss on a few more of your favorite vegetables for a unique salad that gives you a break from traditional heavy holiday fare. And check out My Paris Kitchen for more delicious recipes. Now, if we could only find those breakable ornaments … Peter, where’s that genius now? Rub steaks with chipotle powder and salt. Refrigerate, uncovered, for one hour. Meanwhile, mash butter and mustard powder in a small bowl and set aside. Heat vegetable oil in a large skillet (cast iron is best) over high heat and sear steaks 4 to 5 minutes per side. Remove to warm plate and top with mustard butter and freshly ground black pepper. When cool enough to handle, cut steak into 1/2-inch slices or 3/4-inch cubes. Set aside. Preheat oven to 400 degrees F. Wash and peel potatoes. Cut into 1/3-inch-thick slices, then cut slices into matchsticks. On lined baking sheet(s), spread potatoes in single layer, drizzle with olive oil, and sprinkle with thyme and salt. Bake for 45 minutes or until golden brown, stirring several times. Remove potatoes from oven and set aside. Divide greens into two bowls. Top with steak and French fries, drizzle with pumpkin seed oil and more freshly ground black pepper, and serve immediately.